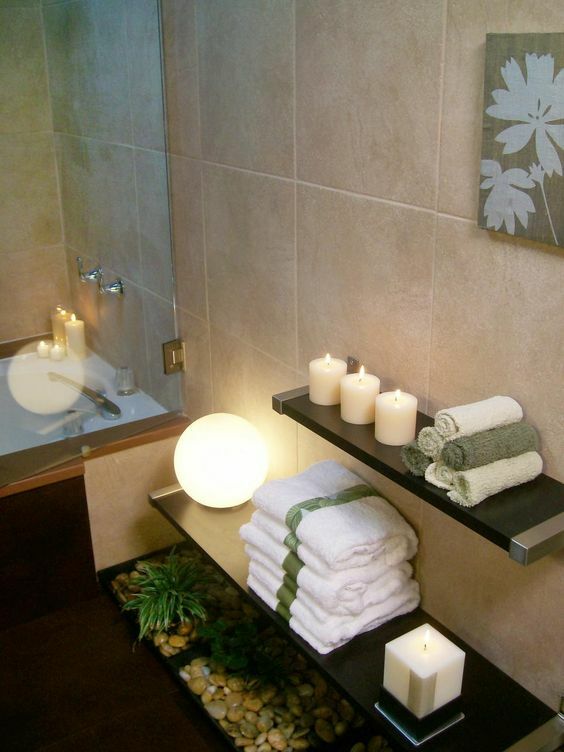 12 Affordable Decorating Ideas For A Bathroom Spa! Leah Remini says: “There’s a lot involved in going to the bathroom for women.” Well, we couldn’t agree more. Nowadays, we can only add men to this sentence to complete it. 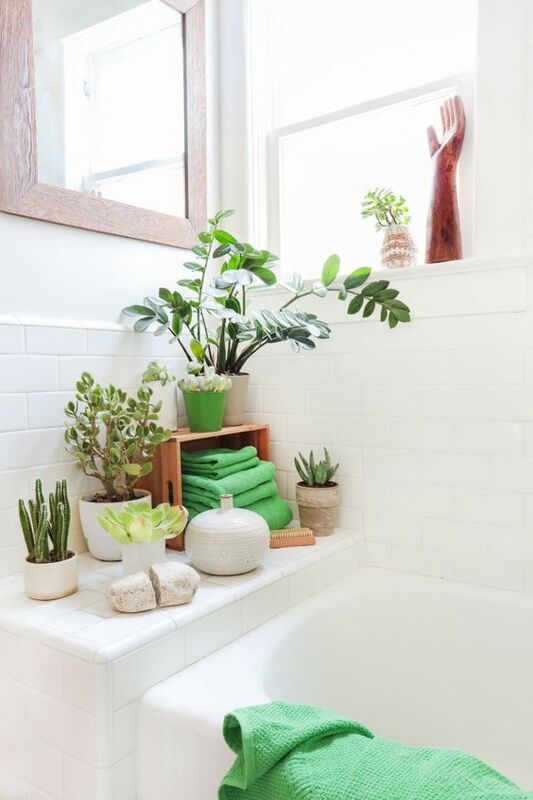 Do you feel good with the way your bathroom currently looks? Maybe some change will light up the place and it can be even more inviting. Styling your bathroom on a budget is quite possible, my friends. But what can we do that is affordable and gets us excited about entering the place in our home for some alone time? Keep reading into our choices for a perfect Spa at home! 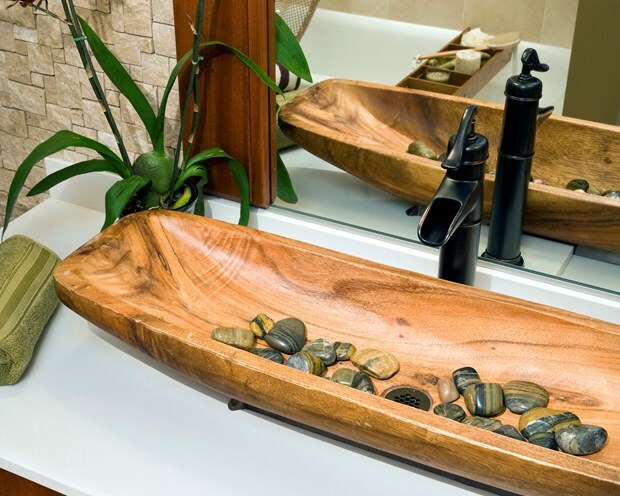 Sometimes something as little as the stones in the sink can change the bathroom spirit tremendously. Set some green plants around the sink, then put some beautiful stones inside. Stones signify the feeling of peace, tranquility and bring a subtle charm to the place. Stones also bring the feeling of stability, gravity, feeling connected to the earth. 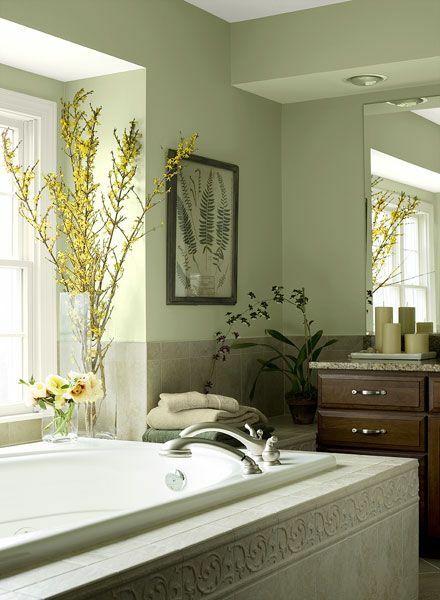 It is true – bathrooms can be the oasis where we take care of our body, mind, and soul. Put your mind at ease by looking at this bathroom decoration. The stones bring a natural look, it feels as if you are taking a shower inside nature. The lights are subtle and the thoughts will easily vanish in this meditative environment. 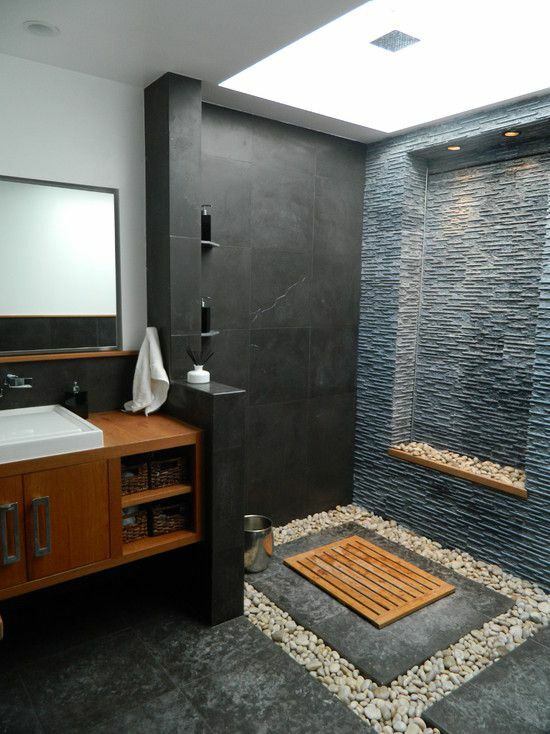 There is sort of layering of stones in this bathroom, creating also the illusion of taller walls inside the home. In this environment, not a drop of worry can replace the drops of water from the shower. 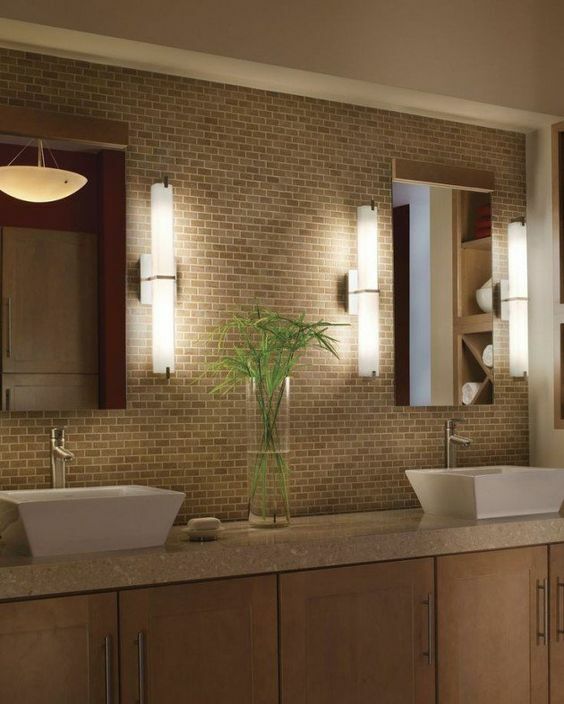 Bathrooms are more spacious and inviting when they have the right lighting. You can see these lights have been installed around the mirrors and when we look at decorations, we should always look for the light that compliments the details, that underlines the theme. It has been proven that lighting has an effect on our perception and sensory experiences. 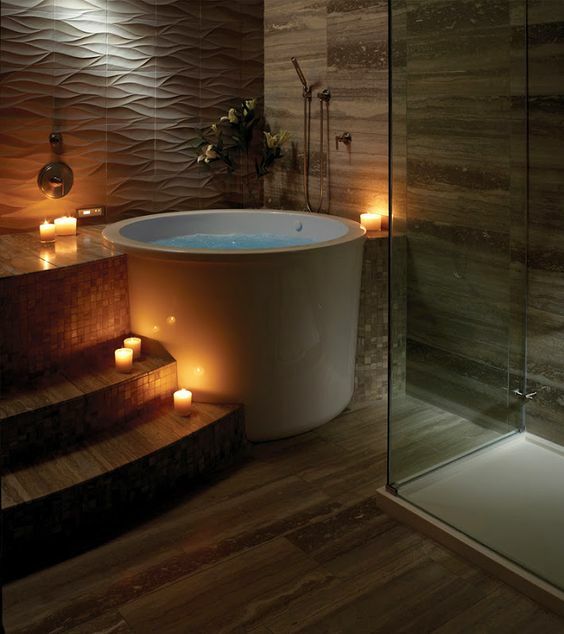 Turn the lights on, it’s a personalized spa at home. 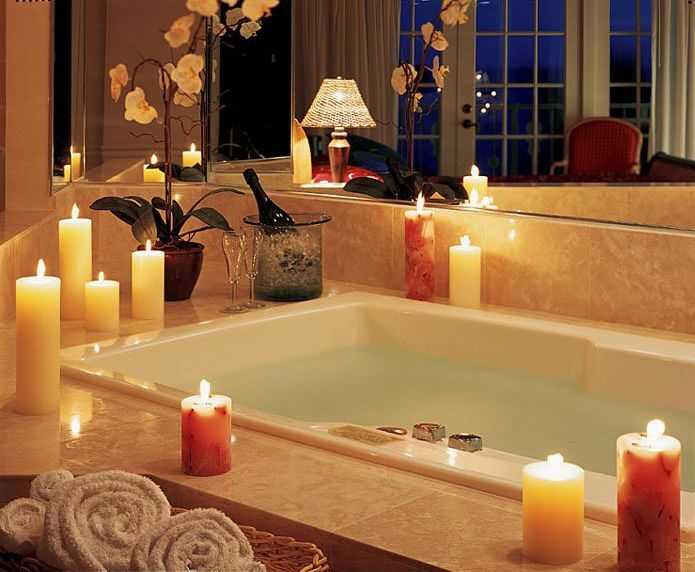 Candles around the bath tube and on the shelves are stripping down the unnecessary decorations. Use an uneven number of candles on the shelves, keep it simple, stylish and chic. Taking a bubble bath is one of the most relaxing experiences. Change a little of your decoration and see how an empty shelf can turn into a designated spa corner of the room. Once again, decoration works on an unconscious level – we don’t really notice it in a while, but nonetheless it changes the vibe. Letting go is not an easy thing to do, especially if your bathroom is overcrowded with cosmetics and objects of undefined origin. It’s time to do a massive cleaning and make thing simple again. Keep the objects around you to a minimum and while you indulge in your regular bath time, it will feel much better. You can use this time to visualize, let go of mind-boggling ideas and relax from head to toe. Now, showers haven’t been the same for a while. They changed along with everything else. 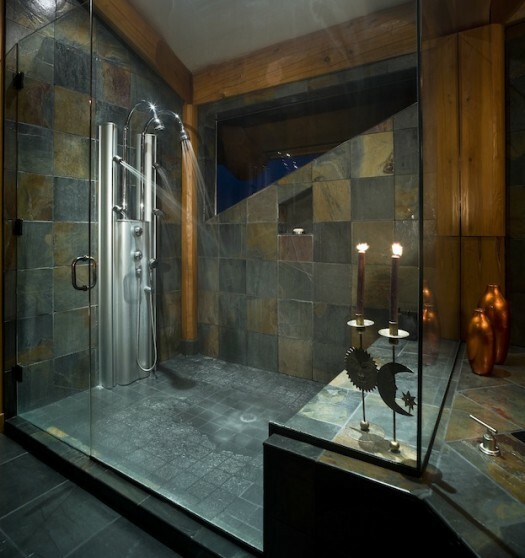 As a matter of fact, showers have become more and more functional, providing water massages as well as a wide range of water streams. In this particular case, two objects stand out – the sun and the moon. This is an emotional energetic recharge and we can see somewhat of a mystic bathroom with the colors of the moon. A bottle of champagne can be the greatest decoration of all. What can be more pleasant than the contrast between a chilled glass of bubbly and the warmth of the bubble baths? I would be singing here, but don’t mind me – it’s just my voice singing Michael Bubble’s “Feeling Good”. Can you blame me? Singing in the bathroom is “must”, considering the influence the decoration has. Circles are beloved shapes for home decorators around the world. They are distinctive, luxurious and always settle quite well inside a bathroom, considering modern day homes have square or rectangular shapes. In this case, this piece of functional decoration is small but truly cozy and unique. Try to incorporate the shape of the cirle into your home, it has some Spa qualities on its own. Absolutely adorable, thumbs up for number eight. Flowers of different kinds can fit pretty well inside a bathroom. They completely change the energetic field inside the room and grace us with the loveliest views. Flower petals in the bathtub are also a bright idea, leave essential oils around and bath salts to compliment the effect of the flowers. Whether you choose living ones or decorative from a local store, you may really want to try and see for yourself how the flowers change the bathroom interior. This must be my favorite of these twelve decorations. 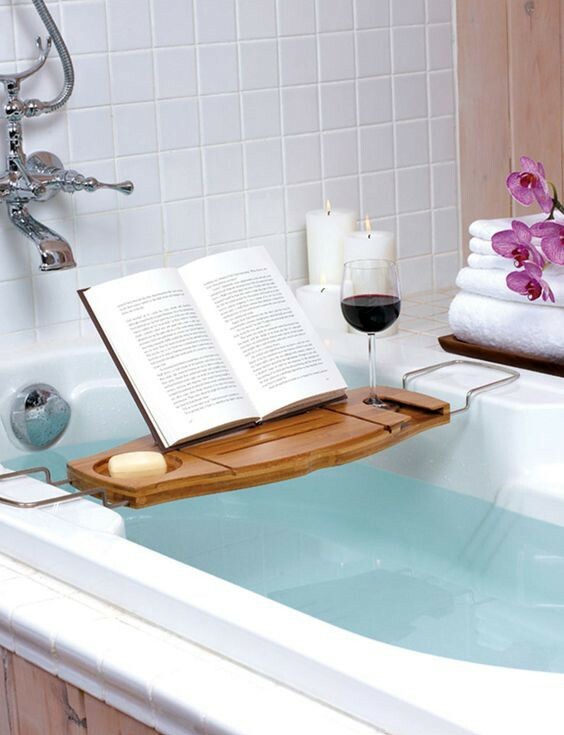 Reading a book inside the bathroom without getting it all wet, is now possible. What can be more inspiring than a beautiful book, a glass of red wine and the discovery that life is beautiful? Not because you have to be positive, good and bright every single day. But because your bathroom is perfect as it is and it will remind you unconsciously that you are perfect as well. Warm towels, bathroom slippers and a play between the light and dark floors. 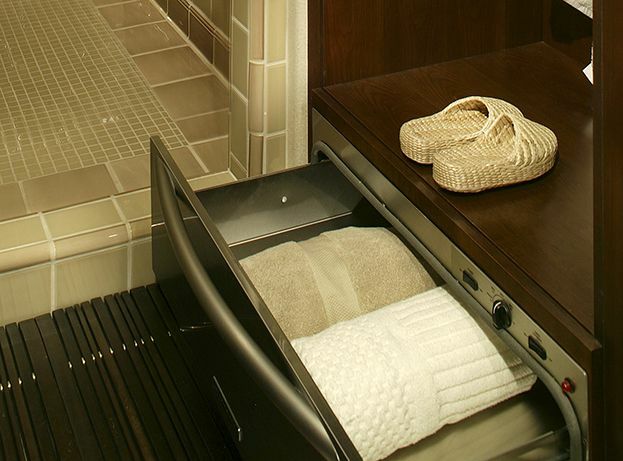 Luxurious warm towels are stored in a drawer and kept warm easily. Have you bought some new towels recently, btw? Sometimes even changing the color of our towels can change the mood. Tidy up in case you haven’t recently, cleanse your bathroom and I guarantee it will show. Clean spaces put our minds at ease, they don’t create unnecessary thinking. A white bathroom’s atmosphere can be easily moderated by adding decorations from the local shops. Whether it is wooden hands, fixtures to hang your luffas on – the ideas are endless. Chek out smaller shops rather than the big stores because there can be found unique handmade objects. Isn’t that better than having the same bathroom right from the catalog of big brands?